Now we head up north to visit Lady Liberty. She’s always been self conscious about her size, only wanting to date guys taller than her, etc. Now she’ll be forever indebted to Jay Jacobs because this screen (on its side) dwarfs our little patriotic vixen. If she’d just put her arm down every once in a while, the screen would be nearly twice as tall as her statuesque figure. You may think that everything’s bigger in America. Well, even though we don’t like to admit it, other countries have big stuff as well. 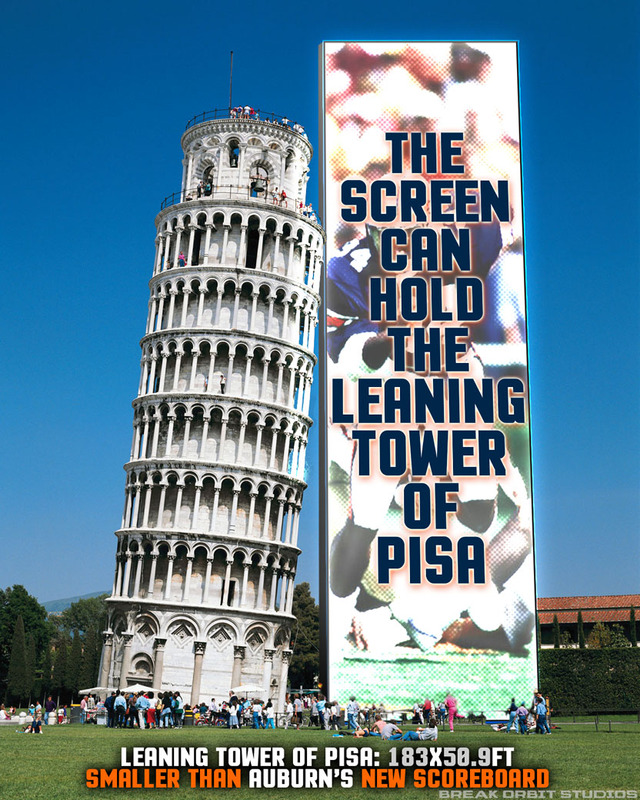 Take the Leaning Tower of Pisa over in the old country, Italia. I’ve always wondered how people were brave enough to go to the top of a tower that is obviously on its way down. The only way I’m doing it is if they hold it upright with the new screen once it’s retired. Because yeah, it’s taller than the whole tower. 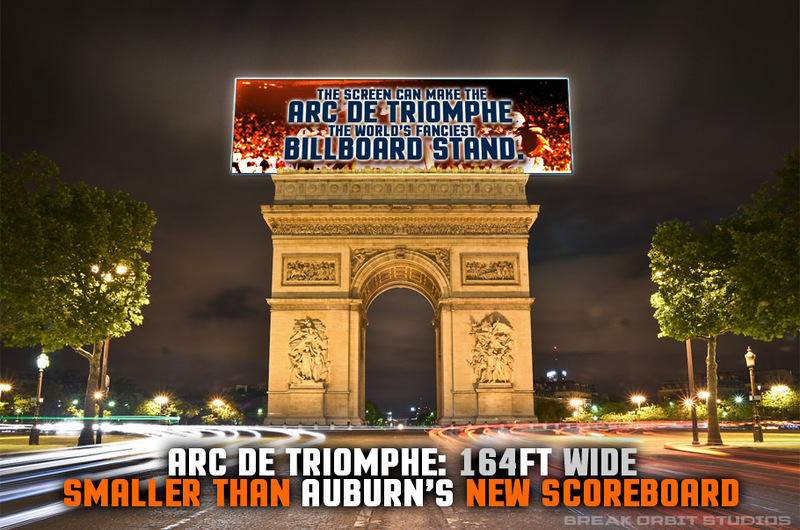 And how about that Arc de Triomphe in Paris, France? Yeah, it’s all historical and stuff, but it looks like a good billboard stand to me. I bet some Lamar ads would look good on that thing. OH NO! Where’s Mothra when you need him? Godzilla has returned after being killed off, like, 100 times! No worries, just stack this new screen on its end, put Cam Newton’s likeness on it, and send that lizard back to the watery abyss where he belongs. 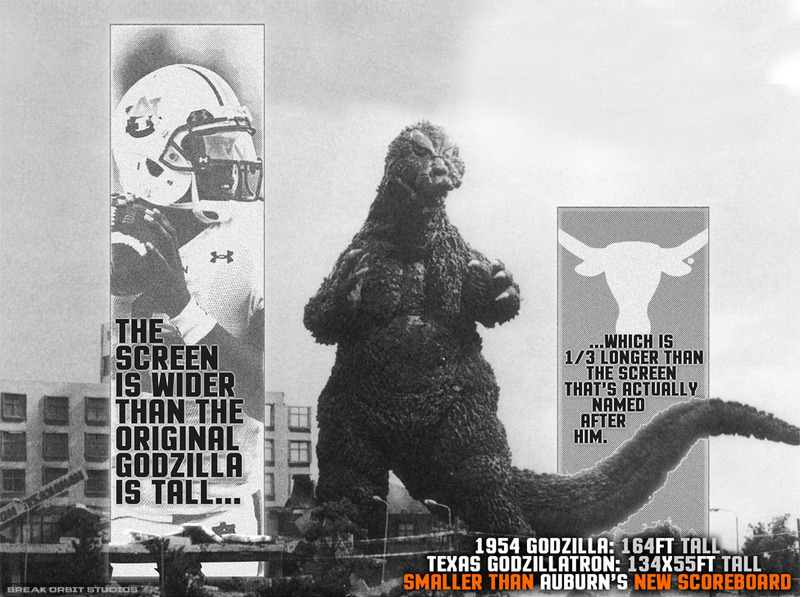 Oh, and Texas calls their tiny little screen the Godzillatron, so I guess Auburn’s is the Godzillatronplex. 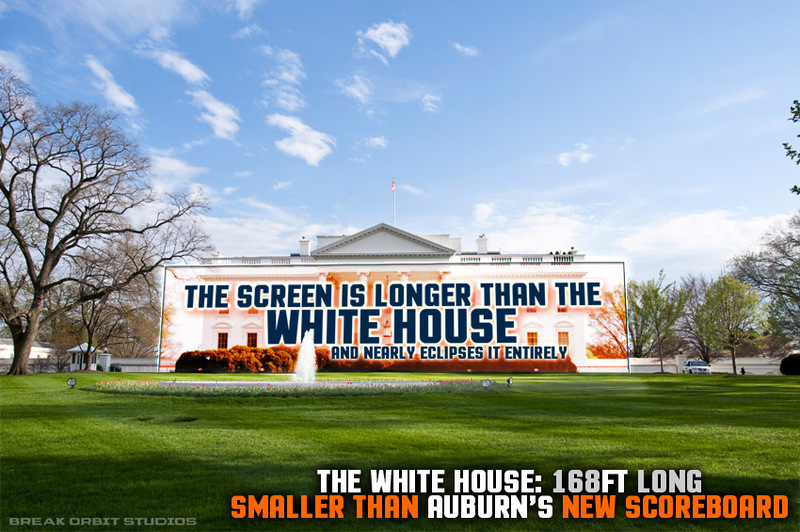 Lastly, we return to the States, the State actually, to take a look at how Auburn’s shiny new screen will compare to Alabama’s four cute little screens they put inside their 100,000 seat stadium that has hardly ever reached capacity. Oh, let’s just go ahead and stack them up. Nope. not even close. Well, let’s just throw them on top of those chimes they love. NOPE. Sorry ’bout it. So yeah, this thing is big. I’d be willing to bet you on that. Do you want to see how this screen stacks up to other landmarks? Leave them in the comments and we’ll see what we can do. The Wall is 700 feet high. Sadly over three times as tall as the screen is wide. Maybe we should go bigger. It’s a great thing that they have decided to approve this giant tv screen instead of doing things like moving the Econ department out of the basement of the Haley center. Or creating a better building for the math department. I am glad this school has its priorites straight. If you knew anything, you’d know that they are building new Mell St classrooms in order to tear down Haley completely for new buildings, as well and Parker and Allison. Additionally, the two financial programs are independent from each other with basically no correlation. 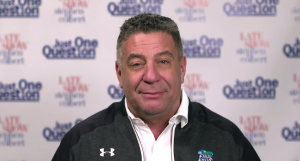 It would be unethical to take from funding raised by the athletic program (tickets, concessions, etc). In summation: different projects are happening, you just don’t know about all of them. Thank you. 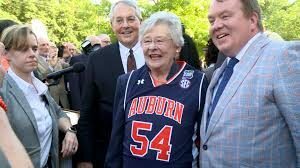 The athletic departments money and the university’s money have nothing to do with each other they are serperate entities. Everybody saying that additional seats should be added instead of an A/V upgrade has obviously never seen the ticket sales figures. Sell outs aren’t common. Also, minutes from SGA also discuss how many people leave early. Remember last year’s Samford game? 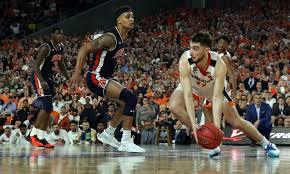 It could be that every game if more seats were added. 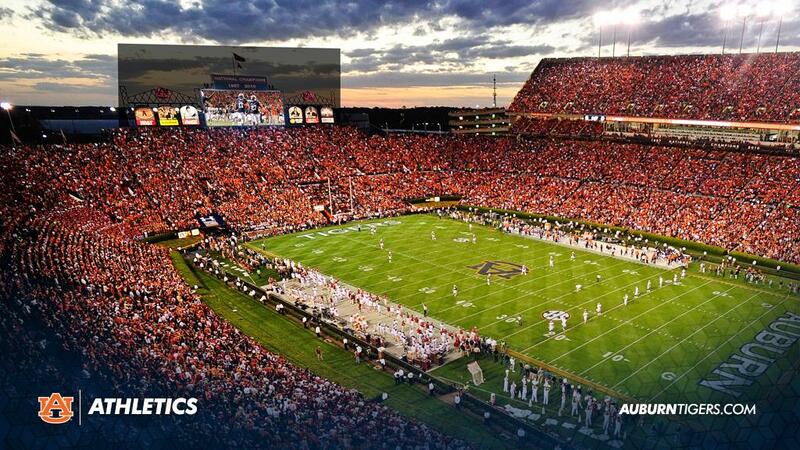 Comparing the current A/V setup to other stadia — Jordan-Hare’s is grossly outdated. Go big or go home is how I personally look at it seeing how if there is a seating expansion of some sort then this will be adequate to support it. Who is supplying the funds is a bit murky to me I will admit, especially considering athletics just posted a 13 million dollar deficit. 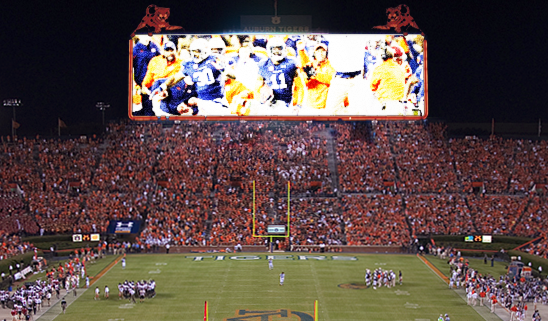 Regardless, can’t wait for the kick-six to blare over the new sound system this fall! 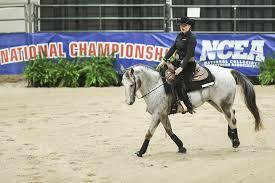 Also, those knocking Allison and Parker obviously lack the intelligence required to have a degree that forces them to spend a majority of their collegiate career in those two buildings. Take a moment and look up the building replacement planned and its timetable. Funny part is that you’re complaining they need to be torn down, but as soon as construction starts you will likely be on Yik Yak complaining about construction on campus. It would take 36 and a third Nick Sabans to be as tall as the board is wide. 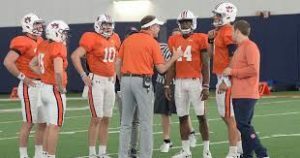 It would take only 32 and a half Gus Malzahns to reach the same height. 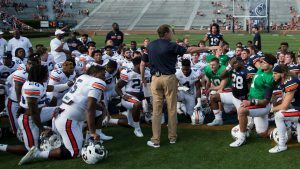 But how would it compare to Nick Saban’s ego? Almost as wide as the flight deck on a modern carrier. If you took the U.S.S. Constitution and placed it on the screen, aside from a smashed screen and a landlocked historical treasure, you would have just a few feet hanging off of each end of the screen. The two active GZ-20 Goodyear blimps are 192 feet long, 59.5 feet tall and 50 feet wide, according to Goodyear. This means that if the Goodyear blimp were to be displayed on the screen, the blimp would be smaller than the projected image. 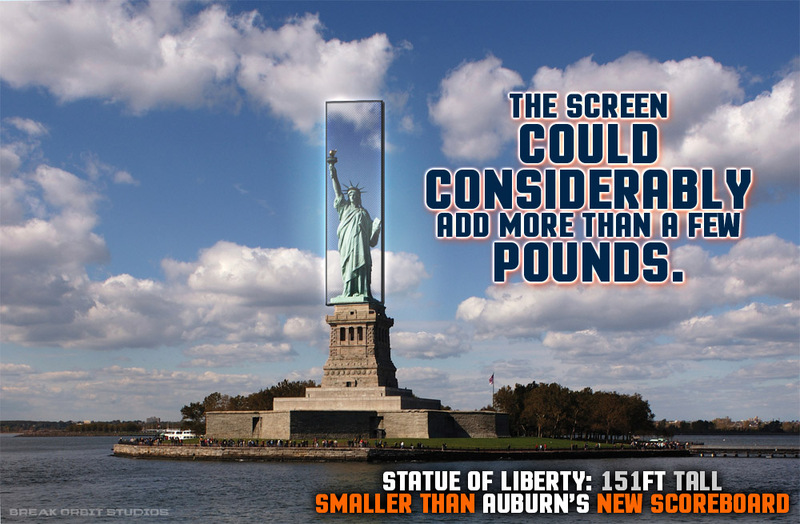 Looks like Auburn is overcompensating for something…. 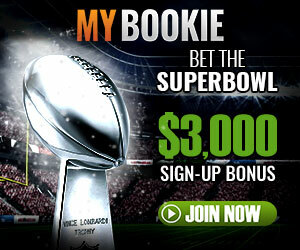 Have u seen boards at Everbank Field in Jacksonville? 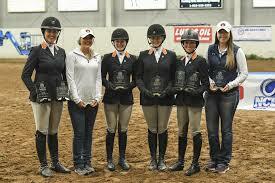 Didja notice how those comparisons leave bammer in second place ? It will be the WDEtron.